News and Events: Save Now with Our Summer Sale! Posts Save Now with Our Summer Sale! Our Summer Sale is he re! 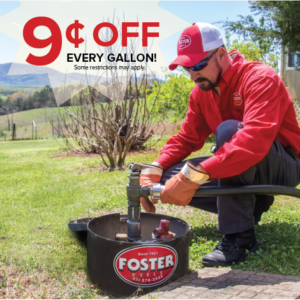 Now through July 31, 2015, residential propane, home heating oil, and kerosene customers save 9¢ a gallon when you fill your tank with Foster Fuels. To take advantage of this great offer Foster Fuels must completely fill your tank and your order must be placed before July 31, 2015. Don’t miss out! Give us a call or order online today! This sale does not apply to contract customers or delinquent accounts.